The P4 and S4 Truss segments were launched in late 2006 and early 2007, with the S6 Truss being launched in 2009. As such, the oldest batteries on station are now 10-12 years old and are reaching the end of their design life. The oldest Truss segment, the P6 Truss, was launched in 2000, however its 12 batteries were replaced with new Ni-H2 batteries during the STS-127 and STS-132 Shuttle missions in 2009 and 2010. The batteries on the S4 Truss were also replaced with new types back in early 2017. Due to their aging, replacement batteries are required in order to sustain the ISS out to its currently planned retirement date of around 2030. However, Ni-H2 batteries are now considered to be old technology, as most of the station’s systems were designed throughout the late 1980s and early 1990s. The ISS Program, therefore, decided to modernize the station’s batteries during the replacement process, by moving to modern Lithium-Ion (Li-Ion) batteries. These battery types work via lithium ions moving between electrodes during the charging process, rather than pressurized hydrogen gas as used in Ni-H2 batteries. The focus of US EVA-52 was to replace the batteries on the P4 Truss (which was launched in September 2006, making its batteries now over 12 years old) Integrated Electronics Assembly (IEA) – specifically, power channel 4A on the P4 IEA. EV-1 was NASA astronaut Anne McClain, wearing the spacesuit with the red stripes, and EV-2 was Nick Hague, also from NASA, wearing the plain white spacesuit. Both were making their first spacewalks. The EVA got underway at just over midday GMT. Hague was originally scheduled to perform this EVA last year, but a deferral of the spacewalk was required due to the crewing impacts associated with the aborted launch of Soyuz MS-10 in October 2018. 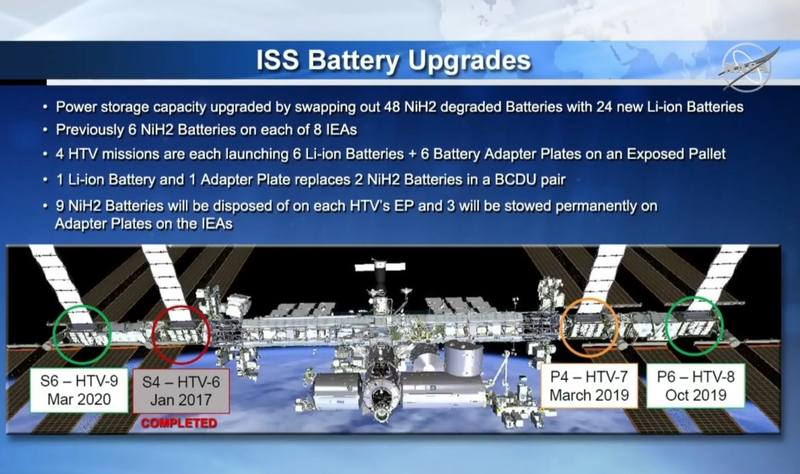 The deferral also necessitated the HTV-7 spacecraft – which delivered the new batteries to the ISS on its Exposed Pallet (EP) back in September 2018 – to leave its EP behind at the ISS, rather than dispose of the EP, loaded up with the old batteries, upon its departure from the station. 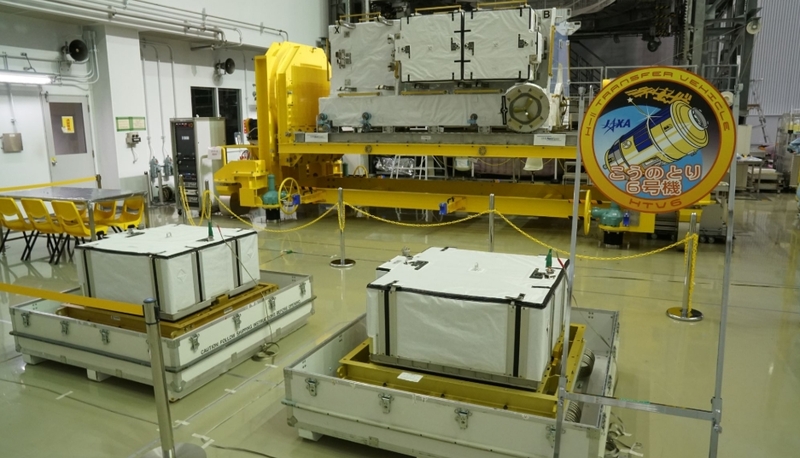 As such, the EP with new batteries has been temporarily stowed on the Mobile Base System (MBS) Payload ORU Accommodation (POA) since that time. A large amount of preparation work has been carried out prior to the spacewalk, with the first step being to transfer channel 4A’s loads onto another channel and fully discharge its batteries. The EP holds nine batteries in total, however it only launched with six batteries, as this is all that is required to replace the 12 batteries of the two power channels on the Truss segment. Each of the six Li-Ion batteries was mounted to an adapter plate during launch, but these were separated during the installation process, with the Li-Ion battery installed on the ISS in place of one Ni-H2 battery, and the adapter plate installed in the place of the second Ni-H2 battery per each string. The Li-Ion battery was then be linked to the adapter plate via a cable, which will essentially allow the single Li-Ion battery to be connected to the slots previously occupied by the two Ni-H2 batteries. 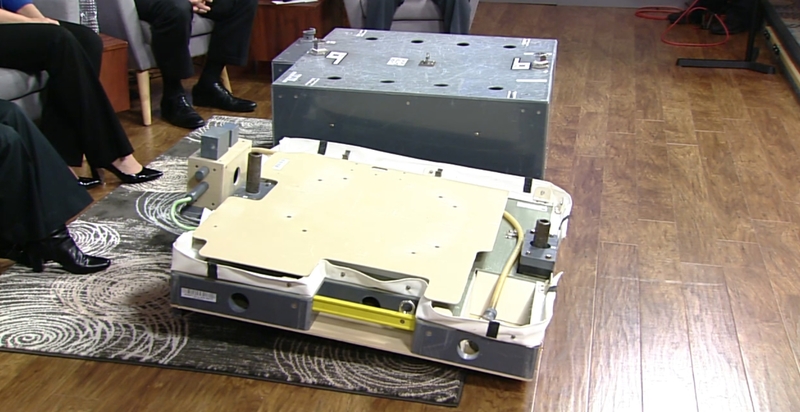 These three batteries were installed on top of the adapter plates, although they will be unused and completely disconnected from the power channel, and are likely to remain on the ISS for the remainder of its life due to lack of available disposal options. Over the past few weeks, the SPDM, controlled from the ground, removed four of the six Ni-H2 batteries from power channel 4A on the P4 IEA, installing three of them into three empty spaces on the EP, and another onto the SPDM’s own Enhanced ORU Temporary Platform (EOTP) storage interface. The SPDM then removed three new Li-Ion batteries from the EP and installed them into the vacated Ni-H2 slots on the P4 4A IEA, leaving three adapter plates exposed on the EP ready to be used by the spacewalkers. 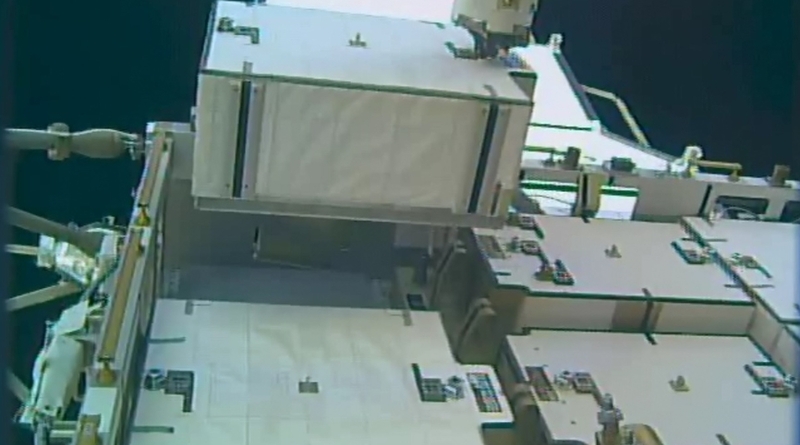 Upon egress from the Quest airlock, the first order of business for McClain and Hague was to translate to the EP on the MBS POA, and removed two Adapter Plates (APs), following which they will each carried one AP out to the worksite on the P4 IEA. Once at the worksite, McClain installed one of the APs into an empty slot that was previously occupied by an Ni-H2 battery, but which was removed by the SPDM. She drove two bolts to connect the AP to the IEA, and then connected a single data cable to link a new Li-Ion battery – previously installed by the SPDM – to the AP, creating a single string. Hague then released a still installed Ni-H2 battery – a large box-like object with two bolts (labelled H1 and H2) and blind-mate connectors – from a second string on the IEA, and installed it onto the AP of the first string for long-term stowage. The pair then installed the other AP into the newly vacated slot from the Ni-H2 battery of the second string, and connected its data cable to a pre-installed Li-Ion battery to complete the installation of the second Li-Ion battery string. A Ni-H2 battery from the third and final string on the IEA was then be uninstalled from its slot and installed onto the AP of the second string for stowage, which left an empty battery slot in the third string. 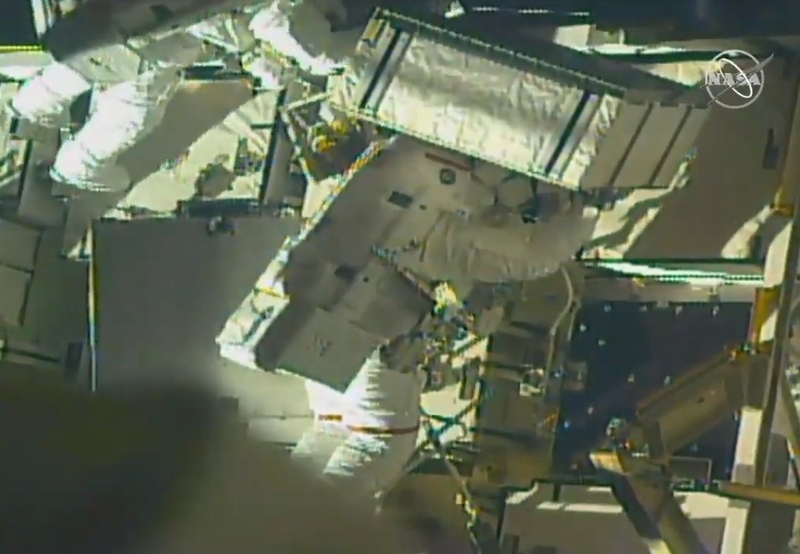 Both spacewalkers then headed back to the EP and retrieve the third AP, translated back to the P4 IEA worksite, and installed the AP into the empty battery slot on the third string. Following the mating of the data connector between the AP and Li-Ion battery on the third string, the 4A power channel Li-Ion battery replacement was complete, and the channel was re-commissioned and began re-powering loads. Both spacewalkers – after some clean up tasks – then headed back to the airlock to conclude the EVA. This was set to be the historic first all-female EVA, after Koch had been scheduled to conduct this spacewalk with astronaut McClain. However, after consulting with McClain and Hague following the first spacewalk, mission managers decided to adjust the assignments, due in part to spacesuit availability on the station. McClain learned during her first spacewalk that a medium-size hard upper torso – essentially the shirt of the spacesuit – fits her best. Because only one medium-size torso can be made ready by Friday, March 29, Koch was to wear it. 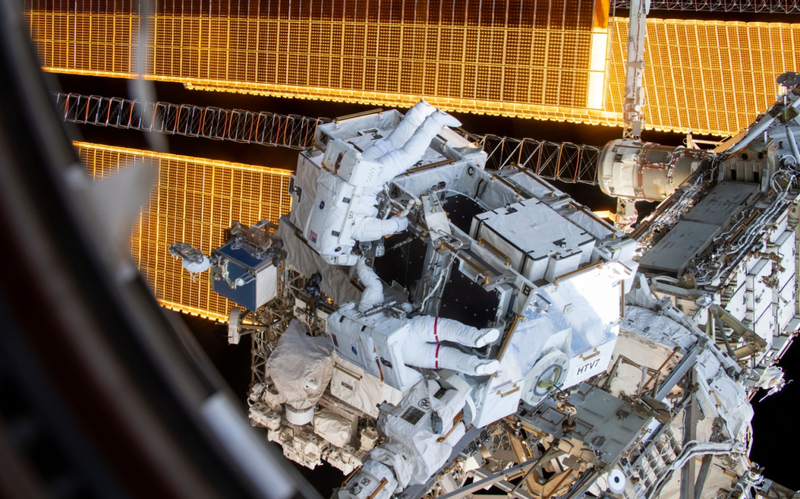 With Hague conducting his second spacewalk, EVA-53 was a repeat of EVA-52, focused around three adaptor plates and three new batteries during the 216th spacewalk in the history of International Space Station assembly and maintenance. It was completed without issue – including some get-ahead tasks – after an EVA lasting just over 6.5 hours. 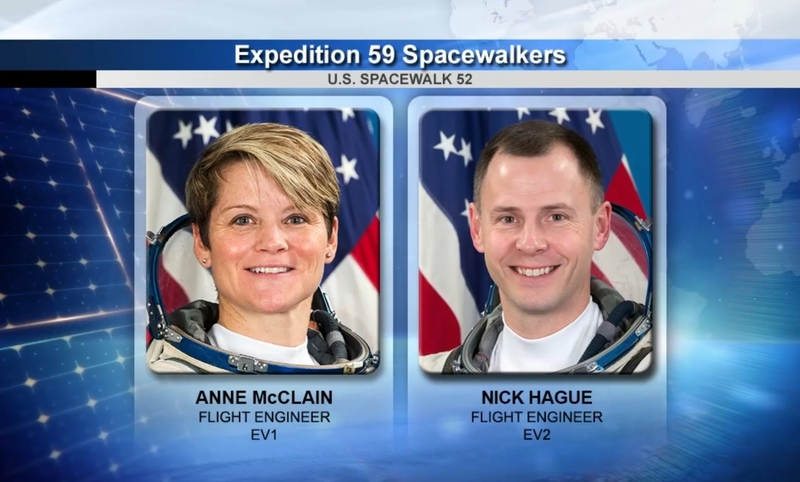 The third and final spacewalk in a trio of EVAs took place outside of the International Space Station (ISS) as Expedition 59 Flight Engineers Anne McClain of NASA and David Saint-Jacques of the Canadian Space Agency conducting another spacewalk on Monday. The main task of the EVA was to establish a redundant path of power to the Canadian-built robotic arm, known as Canadarm2 in public circles but best known as the Space Station Remote Manipulator System (SSRMS) to space flight followers. One task is related to the previous EVAs, related to the batteries. They are installed cables to provide for more expansive wireless communications coverage outside the orbital complex, as well as for enhanced hardwired computer network capability. Cable laying took up the bulk of the spacewalk, as the duo placed jumper cables between the Unity module and the S0 truss, at the midpoint of the station’s backbone. They also installed cables to provide for more expansive wireless communications coverage outside the orbital complex, as well as for enhanced hardwired computer network capability. This was David Saint-Jacques’ first ever spacewalk and the first by a Canadian in over a decade – somewhat fitting given it involved the SSRMS as that Canadian asset continues to play a vital role on the Space Station, marking one of Canada’s major achievements in human space flight. The pair took part in a near seven-hour-long operation, beginning with the relocation of a battery adapter plate, followed by an upgrade to the Station’s wireless communications system. Finally, the astronauts installed structural equipment for an upcoming external platform designed to hold science experiments. However, the task didn’t go fully to plan, requiring photographs to be taken to allow ground crews to work on an additional plan for a future spacewalk. All the other tasks were completed without issue.